Steen Jakobsen, Saxo Bank's CIO and chief economist is back with real predictions for 2016, following yesterday's "Outrageous Predictions". What follows is a guest post by Jakobsen, with my comments at the very end. I dispense with usual blockquotes (indentation). Everything starting from "Steen's Chronicle" is his. I corrected a few typos and reformatted things slightly for ease in readability, but otherwise, this is his forecast, not mine. “I love to talk about nothing. It's the only thing I know anything about” – Janet Yellen. Sorry, that was Oscar Wilde. Finally! Saxo Bank’s Outrageous Predictions are out. Less important: Fed hiked! China will do better than expected – the easier monetary policy, but more importantly the “internationalization of RMB” will drive demand up, not down. Emerging market will be the best performing asset – Both price and value being cheap. Argentina moving to a floating currency is first good news in three years with more is to come. 2016 will be a year of two halves: A bad start, and a good finish. S&P will trade both 1,800 and 2,200 during the year, but overall 2016 is a “year of transition from zero bound. A new business cycle will start with a “bust” and then a new start. El Nino will impact inflation, growth and commodities positively. The tone of the press conference and “dots” indicates Fed really believes in their forecasts. Four hikes is on the cards for 2016, the market consensus is two hikes offered. The Fed however does tend to deliver the promised hikes. Of course, most commentators think "it’s different this time" . Big Question: Inflation or Not? Euro core inflation is at two year high. 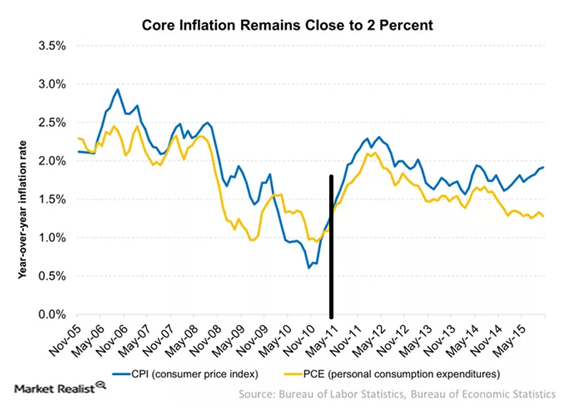 US core-inflation has not only increased but has stayed closed to 2% at all times. 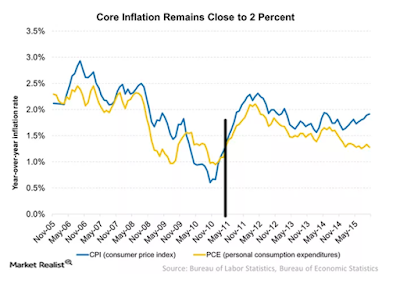 Here is a link to Yellen's Direct Answer to a Question on Inflation. I leave 2015 risk wise very light on positions – my price signals are not flashing yet, and the only positions I will want to own are upside in crude (WTI), Gold/Silver, and a weaker US$. It will take the market a week at least to “get” the message that the cost of money has now started a move higher and probably much higher than most people can even imagine. 80% of all traders in the market today have never lived through a Fed hike cycle and the cost of capital needs to rise – the 57 trillion US$ of debt which has financed the meager growth we have seen since 2009 now needs to be addressed. This ability to accept the discussion, for us to have the conversation has been the highlight for me and it’s a sign of not only a willingness but also a commitment to move towards a mandate for change. I wish all of you happy holidays, may the presents be large and plenty. Steen is a certifiable optimist compared to me. He did not address S&P 500 valuations. Don't they matter any more? 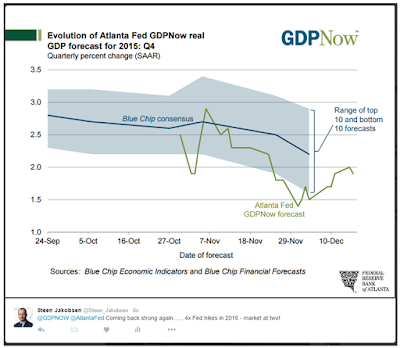 As for Yellen's view, since when have Fed forecasts been correct? That said, I certainly appreciate the thought that went into his comments. And I do think he has many themes correct. I too like emerging markets, gold, silver, and I have an eye on energy. It's likely the dollar has peaked, or will soon do so, but not necessarily for the same reason Steen suggests. 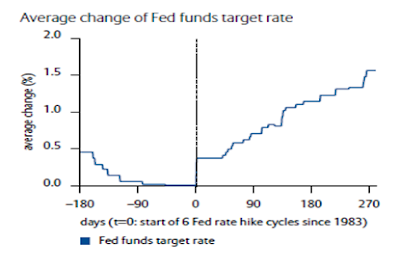 I doubt the Fed actually gets in four hikes. But if they do, I expect them to be unwound at a far faster pace than they rose. I'm still sticking with the general thesis that valuations matter, and this is the most overvalued market in history. Here's my call: Stocks More Overvalued Now Than 2000 and 2007 No Matter How You Look at Things. But valuation is not a timing indicator. Things can always get more over-valued. Yet, at some point there is going to be a payback for years of unwarranted QE that created the biggest equity and corporate bond bubbles in history.